The dates listed below indicate when the Public Service Department will be closed. For holiday weeks, except Thanksgiving, refuse collection may be accomplished on a day either earlier or a day later than their normal pick-up day. During the holiday week of Thanksgiving, collections may be two days early. Citizens should make sure their trash receptacles are in place for pick-up accordingly. Questions regarding sidewalk or driveway replacement should be directed to City Engineering at (308) 535-6724, extension 3220 or 3221. Questions regarding abandoned or junk vehicles should be directed to the North Platte Police Department at (308)535-6789. Nuisance violations such as grass/weeds or other nuisances should be reported to Code Enforcement at (308) 535-6724, extension 3218 or 3242. Questions regarding street lighting should be directed to Municipal Light & Water at (308) 535-6740. The City of North Platte has a household hazardous waste facility at 1308 N. Sycamore which will be open the 2nd & 4th Thursday of each month for the acceptance of household items such as paint, pesticides, herbicides, and cleaners. Only residents of Lincoln County are allowed use of this facility. Hours are 7:00 a.m. – 1:00 p.m. on the 2nd & 4th Thursday of each month, excluding holidays. For other recycling needs, call KNPLCB (Keep North Platte/Lincoln County Beautiful) at 534-8100 or the North Platte Public Service Department at 535-6700. All items must be dropped off in a closed container, weighing no more than 50 pounds or 5 gallons. Call our offices if you do not see your item on this list. Our MissionThe mission of Keep North Platte & Lincoln County Beautiful (KNPLCB) is to educate and interact with the community about environmental issues; and to coordinate beautification, litter cleanup and waste minimization resources for the betterment and benefit of our community. BackgroundThe organization is a local, state and national award winning affiliate of Keep America Beautiful. Established in 1978, the main goal is to eradicate litter and to beautify the community through partnerships with business, organizations and individual volunteers. Involve the public in the business of maintaining a clean environment and promote public pride in the community. Incorporate “care of the earth” activities in school curriculums. Maintain and expand organization, government and business partnerships to a litter-free and beautiful landscape. The Sanitation portion of the Street/Sanitation Division is in charge of the collection of residential solid waste from approximately 8,600 residences, as designated by City Code, and the operation of the City Transfer Station – Composting facility. For further information please call 535-6700. Weekly household waste collection from city supplied 90 gallon wheeled container(s). All household waste must be placed in provided container(s). Weekly yard waste collection from city supplied 90 gallon wheeled container(s). All yard waste must be placed in provided container(s), except at peak spring and fall yard cleanup times. During those peak cleanup times, excess yard waste may be placed in two-ply degradable paper bag(s) and placed beside the yard waste container for collection. Yard waste may never be placed in plastic bags for collection. during the period December 1st through March 31st each year, yard waste only containers may be used for mixed waste. Tree debris and brush collection. City crew(s) normally make one round of collection in three or four weeks. The tree debris, brush – branches should be placed beside the residence’s city provided 90 gallon container(s) for collection. If the residents have too much tree debris, brush or tree branches to place at the alley by their container(s), it may be placed at street side for collection. If the tree debris, brush or tree branches are placed at the street side for collection, the resident should call 535-6702 to notify the Sanitation Division. At no time should the resident block the street or alley with tree debris, brush-branches.Chips collected from tree debris, brush-branches are available to the public at no charge if you load or a $25 fee if the Transfer Station loads them. Chips are located at the City Transfer Station, 3320 West North Lake Rd. Furniture such as chairs, tables, couches, hide-a-beds, etc. Railroad ties, landscaping timbers, posts and poles no more than 10 feet in length or 12 inches in diameter. Fencing materials such as posts, wire fabric, wood slats and supports. Vehicle parts such as fenders, grilles, hoods, trunk lids, doors, seats, tires, wheels and drive train components. No whole vehicles. Totally empty cleaned barrels and steel drums. Appliance collection. City crews normally make a round of the city ever three or four weeks. Appliances should be placed beside the residence’s city provided 90 gallon container(s) for collection. All doors on appliances must be removed or made inoperable prior to set out for collection. The City will pick up clean concrete from residents on a call-in basis. Resident should place concrete near the city provided 90 gallon container(s) for collection. If the resident has too much to place near the container(s), it may be placed street side. At no time should the resident block the street or alley. With one cart, all services except #2 yard waste collection are provided. Maintenance and repair for all city vehicles/equipment. Maintenance and repair of all city communications radios, civil defense sirens . The purchase and distribution of all fuels, except for the golf course and minor purchases at Municipal Light & Water. The Street portion of the Street/Sanitation Division handles most street and alley related maintenance. For further information call 535-6700. Crews periodically patch potholes, seal cracks and do major removal – replacements. Some of this work is accomplished with city crews and some is accomplished by contracted firms. Phone 535-6700. Crews periodically grade – gravel unpaved streets. Generally grading is accomplished after the city has received some type of moisture; i.e. rain. Phone 535-6700. Maintenance to alleys is generally accomplished through call-in and from reports from city crews. Phone 535-6700. Maintenance, installation and repair of street traffic signs such as street markers, stop signs, speed limit signs, etc., are handled by the street/traffic personnel. Phone 535-6700. Maintenance and repair of street traffic signals and school warning lights are handled by park electrical/electronic maintenance personnel. Phone 535-6706. The City Transfer Station – Composting operation is located approximately seven miles south and west of North Platte, just west of the inlet to Lake Maloney at 3320 W. North Lake Road. Hours of operation are 7:00 a.m. to 4:00 p.m., Monday through Saturday. For questions about this operation, you may call them directly at 535-6710 or contact the Public Service Office at 535-6700.
acceptance of used oils placed in 1 gallon plastic containers for recycling. 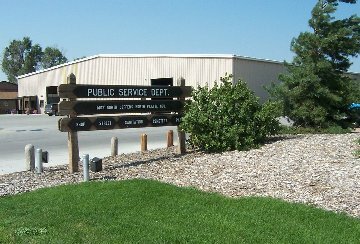 The Public Service Department is responsible for the management of the North Platte Cemetery located on West Rodeo Road (Highway 30). Lyle Minshull, Director of the Parks/Cemetery Division has charge of the day to day operation of the cemetery. At present the cemetery is on 30 developed acres, with an additional 15 acres undeveloped for future needs. In the late 1860’s this area (previously Fourth and Locust Streets) was considered the outskirts of North Platte. 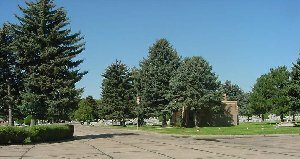 At a meeting held on December 13, 1872 the North Platte Cemetery Association was established and five acres of land were purchased at a cost of $20 per acre. A second meeting was held on June 13, 1873, and the plot of land north of Rodeo Road was divided into lots, which were offered at $10 each.